That’s how I used the surplus from the strawberry bonanza we had this week. I had a feeling that there was more to do with them than sweet luscious desserts, and I was right. Besides this amazing dish, I also found recipes for Strawberry Gazpacho and Roasted Strawberry Rhubarb Sorbet. I’m saving those for later! 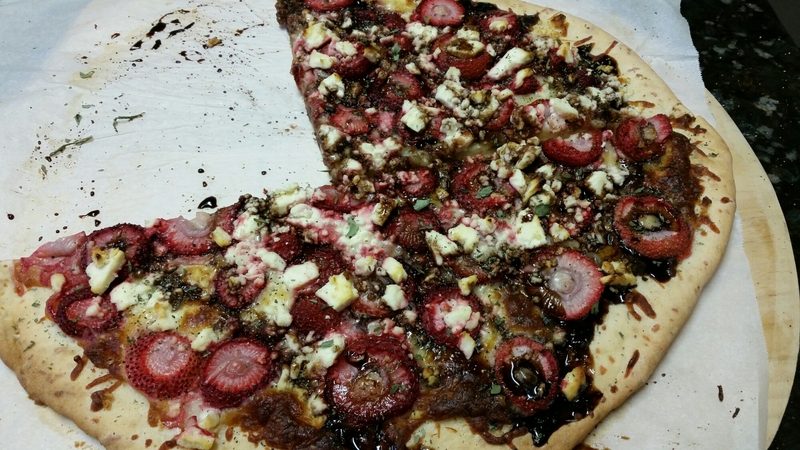 This is where I got the recipe for today’s venture: http://cookieandkate.com/2013/strawberry-basil-and-balsamic-pizza/. One note: I did use feta instead of goat cheese. It came out really delicious – not sweet, but with a really lively savory fruitiness. She also has a link there for a quick no-rise crust, and that’s what I used. It’s a definite keeper. I see quick, easy veggie pizzas in my future. So if you are looking for something deliciously different, try this recipe!